This 100% Cotton King size 3-Piece Coverlet Quilt Set in Blue White Floral Pattern combines the splendor of damask with the timeless quality of quilting to create high style. The white floral damask runs in close vertical rows up a blue background. The print on the reverse offers a change of pace with a small geometric design. It's perfect as an addition to existing bedding or on its own. 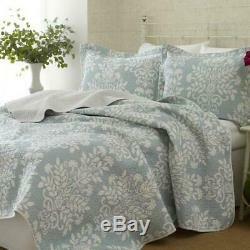 100% Cotton King size 3-Piece Coverlet Quilt Set in Blue White Floral Pattern. Quilt: 96" L x 104" W. The item "100% Cotton King size 3-Piece Coverlet Quilt Set in Blue White Floral Pattern" is in sale since Monday, February 25, 2019. This item is in the category "Home & Garden\Bedding\Quilts, Bedspreads & Coverlets". The seller is "uco-see" and is located in Clarksburg, Maryland. This item can be shipped to United States.